Vous souhaitez poser une question à l'établissement Ruean Phae Royal Park Phitsanulok ? Parfait pour le plaisir et la détente, le Ruean Phae Royal Park Phitsanulok se trouve dans le quartier de Phitsanulok centre à Phitsanulok. De là, les clients peuvent facilement se déplacer et profiter de tous les avantages offerts par cette ville dynamique. Avec les principaux sites de la ville, dont Big C Phitsanulok, Wat Aranyik, HomePro Phitsanulok, à proximité de l'établissement, les clients vont adorer cet emplacement. Au Ruean Phae Royal Park Phitsanulok, l'excellent service et les équipements de qualité contribueront à rendre votre séjour inoubliable. Les clients séjournant dans ce superbe établissement peuvent notamment profiter de WiFi gratuit dans toutes les chambres, ménage quotidien, service de taxi, accessible en fauteuil roulant, WiFi dans les espaces communs. Installez-vous dans une des 75 magnifiques chambres et détendez-vous grâce aux équipements que la plupart d'entre elles abritent : télévision écran plat, SdB supplémentaire, WC supplémentaires, moquette, chaise haute enfant. Les installations récréatives de l'établissement, qui comprennent piscine extérieure, piscine pour enfants, jardin, assurent aux hôtes un sentiment d'évasion et de détente total. De superbes équipements et un excellent emplacement font du Ruean Phae Royal Park Phitsanulok le point d'ancrage idéal d'un séjour à Phitsanulok. Emplacement peu interessant, piscine etc en travaux, nourriture mediocre, chers pour l endroit, pas de terrasse exterieur...! En gros decu par cet hotel qui a peu de charme qui convient just a une escale entre petchabun et sukhotai et non a un sejour prolonge. I like this hotel If returned to north Whenever I have to stay here. I live comfortable Find a restaurant near the tourist area-friendly. The breakfast here to choose lot of good. The opportunity to return for another stay. I like the big room but too old , the staffs at reception counter not so friendly, Breakfast was ok .
Good location and convenient , staffs are friendly, but the breakfast you have to eat under the sun, very hot, especially when they have wedding party. The hotel itself was garish from the outside but the rooms and facilities were pretty good once upstairs. Breakfast was also pretty good. It included rice soup, american breakfast, Thai food with fried rice. Juices, tea and coffee. There was also fruit, toast etc. One of the lifts was broken when we stayed. As it was so busy we were often forced to use the stairs (with suitcases). Now about the busy. I'm not sure whether this is being used as a convention hotel or whether it was just a coincidence. On the day of our arrival there was a university pool party at the hotel which meant the hotel was out of bounds all evening. The music was blasting until 10:00pm and then the students gathered out the front of the hotel to argue violently. My wife felt quite intimidated. The following day, we found that we couldn't summon the lift to take our cases downstairs. After struggling down to reception, we were confronted with a queue of about 100 more university students who had just arrived (apparently unannounced) for a one day tuition and were using the one lift to go up upstairs a few at a time. Check-in and check-out were quick and efficient. Great colourful swimming pool. Pictures on this site are every dated - the hotel rooms are older than they appear. Most of the staff were great. Rooms were clean and comfortable. Breakfast was average. All I want from a hotel when I travel is hot water and a clean room. This hotel was clean but the hot water was rarely available. Frustrating. The breakfast was above average for Thailand but not great. Can't complain. I had a little difficulty with the wifi system, but managed mostly. The TV service was so so, as they had some kind of excuse for why the second-audio channel didn't work, leaving us to watch NCIS in Thai. However, the property is lovely, parking is plentiful and easily accessible, the breakfast was pretty good. We stayed at the hotel during our visit to the Chinarat Buddha at Wat Phra Si Rattana Mahathat, which is only 5 minutes down the street and easily accessible from the hotel. I was not expecting much from a small town hotel, but it was surprisingly nice. 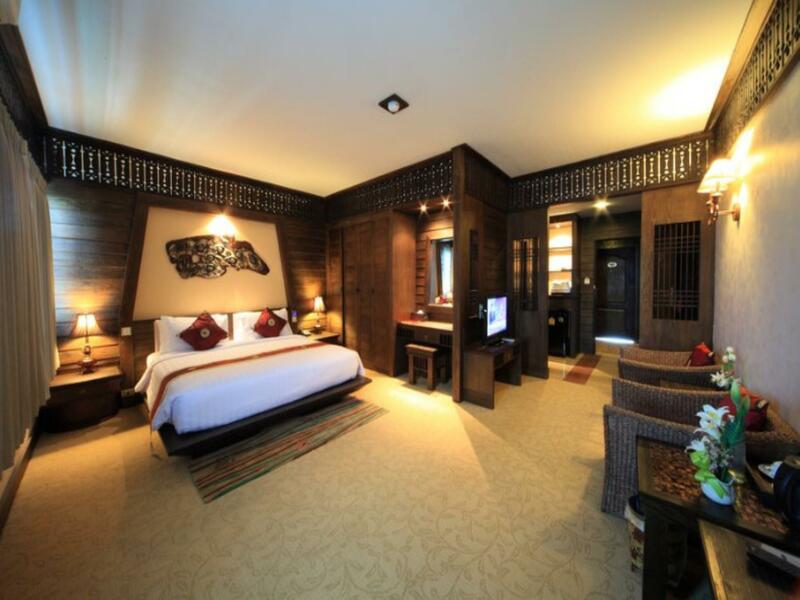 The lobby and dining room are older but very well appointed, and the rooms are comfortable and nicely maintained. We don't normally eat dinner at hotels, but there is nothing in Phitsanulok beside the standard Thai street meals so we gave it a try. We were very impressed. The menu is extensive, the dining room is quite fancy with a live singer, and the staff were very good with our little girl. We were able to order a full fish, three sides and drinks for around 20 USD. The breakfast the next morning was as good as any we have had in Thailand also. Overall, I would definitely suggest this for a stop in Phitsanulok.